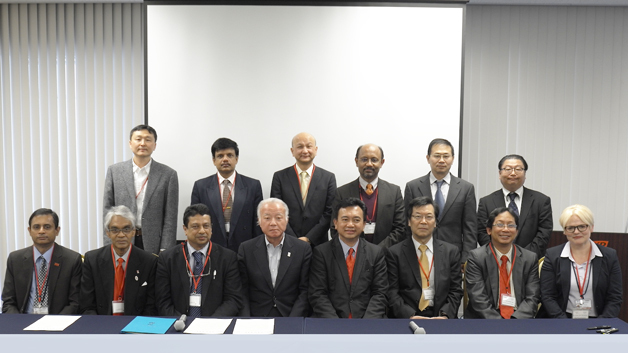 On 15 March 2015, academic and relevant stakeholder representatives launched the International Network for Advancing Transdisciplinary Education (INATE) in a public forum on Transdisciplinary Education for Disaster Risk Reduction. The event was co-organized by UNU-IAS and the University Network for Climate Ecosystems Change Adaptation Research (UN-CECAR) during the UN World Conference on Disaster Risk Reduction held in Sendai, Japan. INATE signifies UN-CECAR and partners’ commitment to the development and implementation of locally-based multi-stakeholder projects on disaster risk reduction (DRR). The launch event also explored the need for transdisciplinary platforms on knowledge integration and academia–stakeholder collaboration. Director of UNU-IAS Dr. Kazuhiko Takemoto opened the event by emphasizing the importance of local capacities in DRR towards the achievement of the post-2015 Sustainable Development Goals. He noted that a more relevant kind of education that employs transdisciplinary approaches is vital in bringing together all stakeholders to address emerging risks and disasters. Event speakers next presented on transdisciplinary education related activities on DRR and case studies that illustrate unique experiences and challenges in designing and implementing such programmes and activities. Prof. Masaru Yarime (The University of Tokyo and University College London) highlighted transdisciplinarity’s role in sustainability science as a connecting platform between academic research and its application to societal problems. Prof. Rajib Shaw (Kyoto University) shared key lessons learned from community projects after the 2004 Indian Ocean tsunami in which a participatory process proved successful. Presenting on studies from Cambodia and Viet Nam, Prof. Toshio Koike (The University of Tokyo) introduced cases where scientific activities – such as data sharing and promotion of knowledge inter-linkages – resulted in cooperation between the scientific community and the public. The event also highlighted cases that encourage active partnership among different stakeholders in developing and delivering effective transdisciplinary education programmes. Explaining how loss and damages caused by disasters can compromise development efforts, Dr. Linda Stevenson (Asia-Pacific Network for Global Change Research) emphasized the importance of addressing research results strategically to provide policy and decision-makers with scientific evidence. Mr. Shigeru Nakamura from Nippon Koei presented on how the company’s capacity development programmes can contribute to INATE. From the Asian Disaster Preparedness Centre, Dr. Senaka Basnayake illustrated how the Centre’s Nilwala River project in Sri Lanka mainstreamed research findings into local policy involving multi-sectoral stakeholders including farming communities. Dr. SB Weerakoon (University of Peradeniya) underlined the importance of homegrown solutions towards sustainability, making local capacity building an essential aspect of project planning and implementation when developing transdisciplinary processes. A panel discussion also explored challenges to transdisciplinary education for DRR, such as finding effective means of implementation and processes that highlight the interconnectedness of solutions and their applicability to local scenarios, and the need to provide periodic evaluation and project monitoring. UNU Senior Vice-Rector Prof. Kazuhiko Takeuchi closed the event by commending the INATE initiative’s contribution to strengthening local capacity towards DRR and sustainable development. This event was held as part of the University Network for Climate and Ecosystems Change Adaptation Research in Asia (UN-CECAR) project activities.